A Pickering firm run by a former minor hockey league goalie has emerged as the recommended winning bidder on the city’s controversial garbage out-sourcing deal, city hall sources have confirmed. An announcement is expected at a news conference scheduled for noon. GFL Waste & Recycling Solutions was founded by Patrick Dovigi, a one-time Edmonton Oiler draft pick who formed the company in 2007 out of three smaller firms – Direct Line Environmental, National Waste Services and Enviro West — that run several transfer stations and hauling operations. The firm bid $17.5-million on a contract to provide residential waste collection west of Yonge Street, significantly undercutting three other large competitors, including Emterra Environmental ($23.9-million), Miller Waste Systems ($20.98-million) and Waste Management of Canada ($23.8-million and an alternate bid of $25.6-million). via GFL winning bidder for Toronto garbage contract | Globe & Mail. A comparison between the announced figure and the numbers provided by staff (in the April report that kicked off this process) sure seem to back that assertion up. Green For Life is claiming they can pick up solid waste in District 2 — bordered by Etobicoke in the west and Yonge Street in the east — for $105 per household, or $95 per tonne. That’s comparatively less than what the current private contractor charges to pick up trash in Etobicoke. There, the costs work out to $119 per household and $103 per tonne. You can see the full comparison in the chart above. I’m hardly an expert on solid waste collection, but I think it’s a safe assumption that solid waste collection in Etobicoke — with wide, suburban streets and leafy culs-de-sac — is a hell of a lot easier than it is in District 2, which includes a wide swath of downtown. In another fun note, Lorinc also reports that the “the city’s recommended seven year contract offer to GFL is actually about $8-million more than what GFL initially bid, due to contingencies, HST recovery and cost of living allowances.” Those extra fees result in a contract that totals about $25.5 million a year, would seem to put the actual year-to-year savings of garbage privatization in District 2 at just under two million dollars. Is GFL’s bid so low that it’s suspicious? 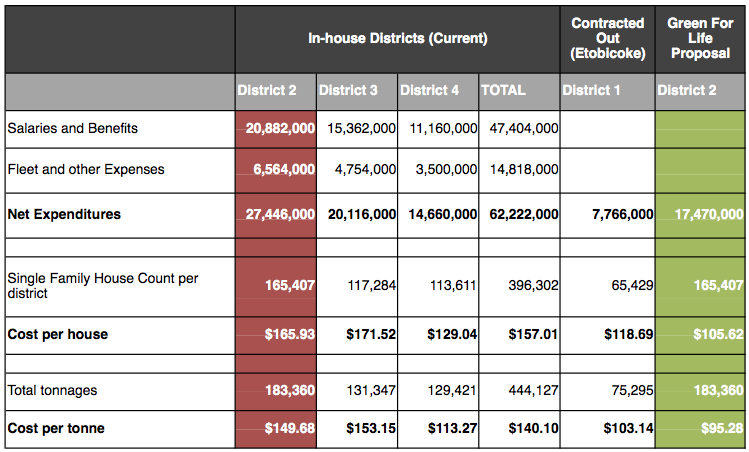 What is the city giving up — in terms of control and/or quality of service — to achieve potential overall savings that, reportedly, could only amount to $2 million per year in District 2? This entry was posted on Wednesday, October 19th, 2011 at 1:16 pm	and is filed under feature. You can follow any comments to this entry through the RSS 2.0 feed. Both comments and pings are currently closed.